After spending several days in the highlands of Ba’ Kelalan, I emerged to the pleasant news that Clare Rewcastle Brown has made it to the list of Fortune’s top 50 World’s Greatest Leaders, in the company of luminaries such as Aung San Suu Kyi, Angela Merkel, Tom Cook and Pope Francis. This recognition by the esteemed multinational business magazine is timely and fully deserved by Clare, whose work has served to expose the corrupt regimes of the BN government in Sarawak and Malaysia. Clare's investigative prowess and professionalism are clearly demonstrated in her lengthy exposes, invariably supported by documentary evidence, published in Sarawak Report. Despite repeated threats and harassment, she has tenaciously delved into the highly dubious practices of political leaders in Malaysia, particularly the former Chief Minister of Sarawak, and the current Prime Minister and his brainchild, 1MBD. Her disclosures have led to investigations by the authorities of several countries into their banks’ dealings with 1MDB. The extraordinary events happening in this country would not have come about without Clare’s Sarawak Report. It is encouraging that the award for Clare comes at a time when the Malaysian media is being subjected to tightening government controls amidst continuing revelations of corruption and cover-ups in government institutions and agencies in Malaysia. Without her persistence and diligence, I am certain that Malaysians and the rest of the world would still be in the dark about the many scandals that plague Malaysia. The target of her investigations may try to discredit Clare’s reports, but this award provides excellent validation of Clare’s work. In contrast, the reverse is true of Najib Razak, whose credibility and reputation have taken a nosedive both locally and internationally. I wish to add a note of thanks to Clare for her immeasurable contribution to the land of her birth Sarawak, in the form of Radio Free Sarawak. This aspect of her work was not cited in the Fortune award, but it has had an enormous impact on the rural population of Sarawak, which had only been exposed to government-approved news until RFS came into their lives. So effective were her team’s broadcasts that her ‘targets’ are believed to have spent millions of dollars to block the radio frequencies she was using. The rural communities are casting off the shackles of the fear and helplessness that had held them hostage for so long. Political awareness is on the increase in Sarawak, and Sarawakians are beginning to speak up for their rights, and for truth and justice. Sarawakians and Malaysians owe Clare Rewcastle Brown a huge debt of gratitude. Congratulations to Clare – the honour could not have gone to a more deserving person. New York's Fortune magazine has named infamous Sarawak Report editor Clare Rewcastle-Brown as one of 'The World's 50 Greatest Leaders' for her role in the exposure of the 1MDB scandal. According to Swiss NGO Bruno Manser Fund (BMF), the Sarawak-born sister-in-law of former UK prime minister Gordon Brown was among the names in Fortune's latest list published this week. The list includes those in various fields whom, according to the magazine, "are transforming the world and inspiring others to do the same". BMF in a statement today called the honour a "surprise move". "Through her website Sarawak Report, London-based journalist Rewcastle-Brown has become an irritant in the corridors of power in Malaysia," BMF quoted Fortune saying in its profile. "Her exposés on state investment fund 1MDB [...] have made her a hero and a villain in the country, depending on whom you ask. "The government has tried to arrest her for 'activities detrimental to Parliamentary democracy' and has banned her website, a move that prompted advocacy group Reporters Without Borders to unblock access and help get her revelations out," wrote the magazine. The controversial journalist is ranked 49 in Fortune's starry list. The whistleblower website had been a thorn in the government's side for its relentless articles alleging corruption primarily in the Sarawak government. However, Sarawak Report's focus on Prime Minister Najib Razak and the 1MDB scandal over the past year finally caused the government to block local access to the website. BMF congratulated Rewcastle-Brown on the honour and lauded her efforts in highlighting corruption allegations that have global implications and urged her to persevere and "continue disclosing corruption and injustice". "Clare's investigations have had a profound effect on the perception of corruption in Malaysia and have exposed the role of leading global banks in accepting and transmitting the proceeds of corruption. "Her disclosures have led to official investigations or criminal proceedings in Malaysia, Switzerland, the US, the UK, Singapore, and other jurisdictions," said BMF. Rewcastle-Brown shares her honours with other notable women on Fortune's list - German chancellor Angela Merkel and Myanmar NPD party leader Aung San Suu Kyi, ranked No. 2 and No. 3 respectively. "Demagoguery, pandering, even populism aren’t leadership. Here’s what is," wrote Fortune of their third list this year, which is topped by Amazon chief executive officer Jeff Bezos. In my Easter message last year, I wrote about the severe problems and challenges this country was experiencing and encouraged everyone to not lose hope, but to act on our hopes by being involved in different ways to bring about an improvement to our society and our country. Since then, the situation has worsened in every aspect. Huge price increases, a worsening currency and economy, political repression and intimidation, suppression of the press and public speech, corruption scandals, embarrassing international scrutiny, and the list goes on. One cannot be blamed for thinking that this is a Godforsaken country for which there is no hope. Many people are leaving this country in search of better lives elsewhere. In fact, it was revealed in Parliament a few days ago that an average of 35.5 Malaysians renounce their citizenship every day. This Easter my message is to hold on fast to hope. The Christian faith is anchored on the hope and salvation that Jesus gave man when he died on the cross to atone for our sins and then arising on the third day. The theological understanding is that Jesus conquered death and sin, the power of darkness that had suppressed man. In the Garden of Eden, God said that Jesus would crush the serpent’s head but in doing so, the serpent would bruise his heel. In crushing the devil, Jesus had to die, but it was not a permanent death for he rose again, hence the ‘bruise’. Spiritually, it helps us to focus on this aspect of our Christian faith when we contemplate the worsening situation we are in today. We must never give in to despair, but to continue to pray for a transformation of this country. Perhaps God is answering our prayers in the unexpected collusion of diverse people in the recent Citizens’ Declaration; perhaps not, but keep in mind that God has said ‘For I know the plans I have for you, plans to prosper you and not to harm you, plans to give you hope and a future’. [Jeremiah 29:11]. The years of hardship may seem long and many ask how much longer we will have to put up with what is going on in this country before there is a change. It is not for us to know the times and dates that God has set for us but with faithful hearts, we must continue to pray and do our part to bring about the change we so desperately need. As we pray for a better leadership in this country, keep in mind that God ‘changes times and seasons; he deposes kings and raises others up. He gives wisdom to the wise and knowledge to the discerning’. [Daniel 2:21]. The ruling political leaders in this country may think they have the upper hand and continue to engage in dubious practices with impunity, but history has proven that corrupt political parties that rule without the mandate of the people eventually fail, no matter how strong they appear to be at their peak. We only need to look at the countries around us to be encouraged. Burma and Indonesia, which were arguably in worse situations than we are in, are progressing rapidly with their reforms and expanding democratic space. Change will happen for us as well. Let us pray that at the upcoming Sarawak Elections, the right people will be elected so that our hopes will be realized, that we will see the politics of hope vanquish the politics of fear, corruption and oppression. To all Christians, a blessed Easter. Dalam mesej Easter saya pada tahun lepas, saya menulis tentang masalah teruk dan cabaran yang telah dialami oleh negara ini dan menggalakkan semua orang untuk tidak kehilangan harapan, bahkan dengan harapan itu kita boleh bertindak dengan melibatkan diri dalam pelbagai cara yang berbeza untuk membawa peningkatan kepada masyarakat dan negara kita. Sejak itu, keadaan semakin merundum dalam setiap aspek. Kenaikan besar harga barang, kemerosotan ekonomi dan nilai mata wang, penindasan dan ugutan politik, kekangan akhbar dan pengucapan awam, skandal rasuah, penelitian antarabangsa yang memalukan, dan sebagainya. Seseorang itu tidak boleh dipersalahkan kerana berfikir bahawa ini adalah sebuah negara yang suram yang tidak mempunyai harapan. Justeru, ramai yang meninggalkan negara ini untuk mencari kehidupan yang lebih baik di tempat lain. Malah, ia telah didedahkan di Parlimen beberapa hari lalu bahawa purata 35.5 rakyat Malaysia menolak kewarganegaraan mereka pada setiap hari. Pada Easter ini, mesej saya adalah untuk berpegang teguh kepada harapan. Iman Kristian berlandaskan harapan dan keselamatan oleh Yesus apabila dia mati di atas salib untuk menebus dosa-dosa kita dan kemudian bangkit pada hari ketiga. Pemahaman teologi adalah bahawa Yesus telah menakluk maut dan dosa, kuasa kegelapan yang telah menindas manusia. Di Taman Eden, Tuhan berkata bahawa Yesus akan menghancurkan kepala ular tetapi dengan berbuat demikian, ular itu akan melebamkan tumitnya. Demi menghancurkan syaitan, Yesus harus mati, tetapi ia bukan satu kematian kekal kerana dia bangkit semula, itulah 'lebam' YESUS. Secara rohani, ia membantu kita memberi tumpuan kepada aspek iman Kristian kita apabila memikirkan situasi yang semakin buruk hari ini. Kita tidak boleh tunduk kepada ketakutan dan putus harapan, tetapi harus terus mendoakan transformasi negara ini. Mungkin Tuhan menjawab doa-doa kita melalui pakatan yang tidak dijangka oleh pelbagai orang dalam Deklarasi Rakyat baru-baru ini; mungkin juga tidak, tetapi perlu diingat bahawa Allah telah berkata, ‘Bukankah Aku sendiri tahu rencana-rencana-Ku bagi kamu? Rencana-rencana itu bukan untuk mencelakakan kamu, tetapi untuk kesejahteraanmu dan untuk memberikan kepadamu masa depan yang penuh harapan’. [Yeremia 29:11]. Kesusahan selama bertahun-tahun mungkin kelihatan panjang dan ramai yang bertanya berapa lama lagi kita perlu bersabar dengan apa yang sedang berlaku di negara ini sebelum adanya perubahan. Ia bukanlah untuk kita tahu tarikh dan masa yang telah Allah tetapkan untuk kita, tetapi dengan ketetapan hati kita harus terus berdoa dan melakukan bahagian kita demi perubahan yang sangat kita perlukan. Apabila kita berdoa untuk kepimpinan yang lebih baik di negara ini, perlu diingat bahawa Allah ‘mengubah saat dan waktu, Dia memecat raja dan mengangkat raja, Dia memberi hikmat kepada orang bijaksana dan pengetahuan kepada orang yang berpengertian'. [Daniel 2:21]. Pemimpin-pemimpin politik pemerintah di negara ini mungkin berfikir bahawa mereka mempunyai kelebihan dan terus melakukan aktiviti-aktiviti meragukan dengan sewenang-wenangnya, tetapi sejarah telah membuktikan bahawa parti-parti politik korup yang memerintah tanpa mandat rakyat akhirnya akan gagal, walaupun mereka kelihatan di puncak kekuatan mereka. Kita hanya perlu melihat negara-negara di sekeliling kita, Burma dan Indonesia, yang boleh dikatakan dalam keadaan lebih buruk daripada keadaan kita, kini sedang berkembang pesat dengan pembaharuan dan meluaskan ruang demokrasi. Perubahan akan berlaku juga bagi kita. Marilah kita berdoa agar pada Pilihan Raya Sarawak yang akan datang, orang yang tepat akan dipilih supaya harapan kita akan menjadi kenyataan, bahawa kita akan melihat politik harapan dapat menewaskan politik ketakutan, rasuah dan penindasan. Kepada semua umat Kristian, selamat menyambut Easter yang diberkati. Central Bank says 1MDB missed the deadline given to produce evidence to back its claim about restructuring exercises overseas. KUALA LUMPUR: Bank Negara Malaysia (BNM) will initiate “appropriate action” against 1MDB for failing to produce evidence it had used the allocated USD1.83 billion for debt management and restructuring exercises overseas. The central bank’s governor, Zeti Akhtar Aziz, revealed that the state investment arm had initially cited these two reasons when asked why the money had not been repatriated to Malaysian shores. BNM, she said, was willing to accept the explanation, granted by 1MDB provided supporting documents were produced. “Yet, they have not produced the documents even after the deadline. “Thus, we are in the midst of taking appropriate administrative and enforcement action,” the outgoing governor told reporters after presenting the BNM annual report here this evening. In October last year, BNM ordered 1MDB to repatriate USD1.83 billion after it revoked three permits granted to the latter for investments abroad. BNM did not specify which permits were revoked or where it believed the USD1.83 billion was being kept. Earlier this year, 1MDB said it redeemed USD1.1 billion from the Cayman Islands and parked it in BSI Bank Limited Singapore, a local unit of Swiss asset manager BSI. Zeti added that the central bank’s role in 1MDB was purely administrative and Bank Negara could issue penalties or compound fines, but the process involved other agencies before such action could be taken. She explained that the main reason Bank Negara was pursuing administrative action against 1MDB was to “uphold the integrity of the functioning of our financial system”. Zeti also rubbished claims of meeting Muhyiddin Yassin to discuss the transfer of USD1.103 billion belonging to 1MDB from Cayman Islands to Singapore. She said this when asked on claims by Muhyiddin that Zeti had informed him of the said sum not having been transferred to BSI Bank Singapore. “I have never held a meeting with Muhyiddin to discuss this issue. However, Zeti clarified that she used to deal a lot with Muhyiddin when he was still the deputy prime minister, especially during the Cost of Living Special Committee meetings. She stressed she would not allow Bank Negara to be dragged into politics and 1MDB. It is no surprise that inflation rates are on the up but Bank Negara Malaysia’s report delves further to reveal that inflation rates are even higher for the urban poor. The central bank’s analysis found that inflation tends to be higher in more urbanised states and for lower income groups. Inflation is also higher than the national average in highly-urbanised states like Kuala Lumpur, Selangor, Penang, Malacca and Johor, where 36 percent of the Malaysian population live. In Kuala Lumpur, inflation is highest for households at the bottom 20 percent of the income scale, recording an annual change of 3.01 percent in 2015. The annual change of the consumer price index is only 2.73 percent for the top 20 percent of households. Inflation rates rise steadily as one goes down the income scale, it found, with the highest level annual change of inflation in 2015 recorded in Malacca at 3.14 percent. The explanation is this – poorer households spend more of their total income on essentials like food. Food inflation, the central bank said, made up the bulk of inflation in 2015. The poorer households also use less fuel and will not have benefited as much from the drop in pump prices. “Thus, the lower income households living in highly urbanised states tend to experience the largest increase in their cost of living,” it said in its 2015 annual report released yesterday. It also found growth in the number of bottom 40 percent households who have taken loans. “Consequently, these households, who only have a relatively small amount of savings, are vulnerable to both income and price shocks,” it said. Household spending data also show that growth of household spending is higher than growth of income for the bottom 20 percent and top 20 percent of households. The bottom 20 percent of households who earn less than RM2,000 are barely earning enough to cover expenditure, it found. The banning of Parti Amanah Negara President Mohamad Sabu from Sarawak by the Chief Minister is mystifying and disappointing. Mat Sabu is a well-regarded politician known to be a moderate Muslim, hardly belonging to the category of racial bigots and extremists, whom the CM had said he would ban from Sarawak. There is no basis for the banning of political leaders from West Malaysia. The Immigration Act specifically allows the entry of Malaysians for legitimate political activities. Opposition and NGO leaders such as Nurul Izzah, Rafizi Ramli, Zuraida Kamaruddin, Tony Pua, Teresa Kok and Ambiga Sreenevasan are advocates for the rights of the people to a true democracy, freedom of speech and assembly, and for fairness, justice and equality. There is nothing objectionable about any of these aspirations. The only reason I can think of for the Chief Minister’s ban on them is to stop them from bringing their message of change to Sarawakians. What is there to fear if you have been serving the people well? There was no reason given for the banning of Mat Sabu. The irresistible conclusion is that this is a political move aimed at obstructing the opposition parties from carrying out their work. This is an abuse of our immigration autonomy, and it is disappointing that we are not progressing as a democracy under this Chief Minister, as we had hoped to. The Deputy Home Minister has defended the Chief Minister’s ban, saying it is the prerogative of Sarawak to deny any individual from entering. It is precisely because this is a prerogative power that the exercise of this discretion must be carried out in good faith. It was never the intention of those who fought for this autonomy that it be used for political purposes. By continuing his predecessor’s high-handed practice of banning opposition politicians from West Malaysia, the Chief Minister has shown that he is, in fact, not that much different from the previous administration, in spite of what he says and the image he seeks to portray. With the Sarawak elections imminent, the BN ministers are all busying themselves to win votes for their parties. In Long Kesseh, Baram, the MP Anyie Ngau is reported to have said that voting for the opposition would result in the villagers missing out on development through projects and grants from the government. The MP should be embarrassed that he has to resort to threatening the people to vote for the BN and he should be even more embarrassed that he does not have a clear understanding of the functions of a government in a true democracy. In a democracy, the people are free to choose their representatives, and the government that is put in place should be a government of ALL the people, by ALL the people and for ALL the people. The money for projects and grants that the MP is threatening to withhold belongs to the people, not to the BN. Every citizen contributes to the national coffers and to the Malaysian economy and is entitled to equal treatment from the government. In case the MP does not know it, the Federal Constitution spells out in Article 8 that all persons are equal before the law. I would advise the MP to recall his oath of office to ‘preserve, protect and defend’ the Constitution and treat everyone equally with respect instead of issuing threats to the people he claims to serve. His behavior should be an embarrassment to the Chief Minister who has declared time and again that he is the CM for all. Instead of resorting to scare tactics, the MP should fall back on the track record of the BN representatives to persuade the people that the BN candidates are worthy of being elected again. Perhaps they have no track record to speak of? The MP was also making excuses for the lack of infrastructure and amenities after over 50 years of BN rule, blaming it on the geography and topography, and advising them to be patient. This is the typical BN modus operandi. Threaten them and then make them sweet promises. The people have been patient term after BN term and look where that has got them – still waiting for what has been promised over and over again. I believe that the people have realised the importance of having a strong opposition and of standing up for their rights. The recent announcement of the revocation of the gazette extinguishing the NCR of the lands for the Baram Dam is proof that people power works. We should not forget that Ministers, MPs and ADUNs are ‘but the servants of the people on whose goodwill and co-operation they are entirely dependent’. They are the ones who need the votes of the people and should refrain from threatening them. During the elections, there is no government, only political parties. Those you label opposition may form the government one day. This is normal in a democracy where there is fairness and openness in the electoral system. In Malaysia, we may have to work harder to make it happen, but it is not an impossible task. The time is ripe for a change, and I urge Sarawakians to stand strong and reject threats, intimidation, scare tactics and the abundant but mostly empty promises of future ‘projects’ and grants. Sarawak’s standing as the third poorest state in Malaysia despite our wealth of natural resources speaks volumes about the 50 plus-year achievement of the BN government. Penang and Selangor have shown that opposition-run states are better governed than BN states. By voting opposition, Sarawakians have nothing to lose, but everything to gain. 'I think all Malaysians need to stand shoulder to shoulder to reject corruption,' says Noor Farida. KUALA LUMPUR: Noor Farida Ariffin is the latest prominent figure to sign the Citizens’ Declaration, a movement calling for the resignation of Prime Minister Najib Razak. The G25 Movement of Moderates spokesperson said that it was high time for the country to restore public confidence and strengthen public institutions. “The full system must be changed. We must establish a system of check and balance which to us is the best guarantee against abuse of power,” she said after witnessing several others inking the Citizens’ Declaration. She however stressed that she was signing the Declaration in her personal capacity and was not representing G25 – a group of eminent Malays. Noor Farida claimed that Malaysia was now one of the most corrupt countries in the world and she was not convinced the country was on track to achieve Vision 2020. She added that some of the problems started with former Prime Minister Dr Mahathir Mohamad, who had led the Declaration. Earlier, social activist and lawyer S Ambiga, Bersih chief Maria Chin, Centre to Combat Corruption and Cronyism (C4) chief Cynthia Gabriel and political activist Hishamuddin Rais witnessed others adding their signatures to the Citizens’ Declaration. Among those who signed were Lawyers for Liberty co-founder Eric Paulsen and Bantah TPPA activist Azlan Awang. The Sarawak government may restart the Baram Dam project after the conclusion of the Sarawak election, Save Rivers chairperson Peter Kallang said. Although the gazette for the project was repealed, he said it could be an election gimmick by Sarawak government for the coming state election. Baram villagers yesterday rejoiced when they learned that the Sarawak government has revoked the gazette extinguishing their customary rights to land earmarked for the dam and its reservoir. Their lawyer, Harrison Ngau, received a notification on the repeal from the state legal office, in a letter dated March 15. Peter urged the Sarawak government to make an official announcement that the Baram Dam project will be stopped permanently. "It could be used as an election gimmick. I cannot predict but they (Sarawak government) have the power to re-gazette. "We think that the revocation is not final. "What we want is for the Sarawak government to announce openly that the Baram Dam is stopped," said Peter when contacted by Malaysiakini. He said the protest will continue, including mounting blockades, if the goverment makes an about-turn after the state election. "If they restart it, we will protest and put up the blockades. I will meet with the Baram villagers to discuss the next step," said Peter. Nevertheless, he said that it was a positive move by the Sarawak government to revoke the gazette. He said that Sarawak Chief Minister Adenan had announced a moratorium on Baram Dam works last July before the gazette was revoked. "We know that he also stopped all logging activities in the vicinity of the dam site, but such activities are still going on," he added. Speaking to reporters at the headquarters of the Dayak Bidayuh National Association (DBNA), ROSE spokesperson, Ann Teo, explained that the “Siapa Tok?” project aimed to connect election candidates to the voters in their constituency. 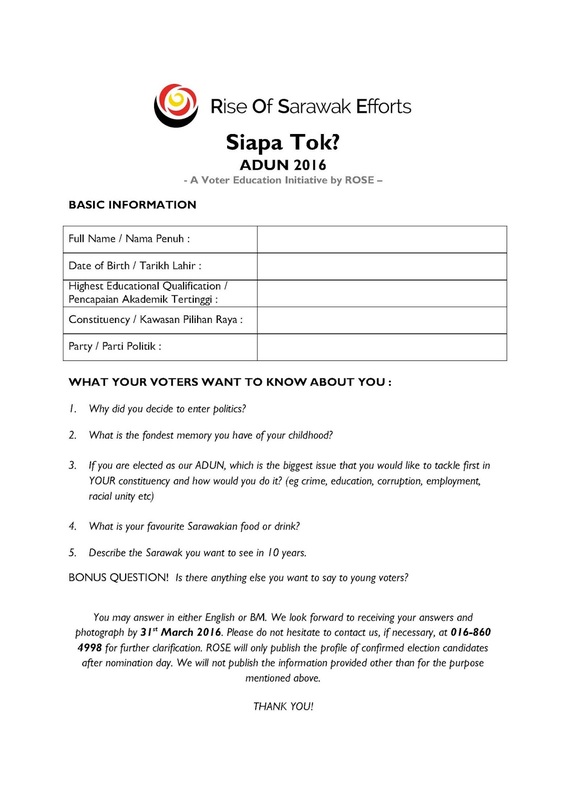 Although the project is mainly targeted towards young and first-time voters, all voters are expected to benefit from the exercise. Candidates across the State have been approached to get involved and their profiles will be posted on ROSE’s Facebook page during the election campaign period. In addition, Teo said, as Sarawakians are essentially paying the salaries of their ADUNs, the campaign season should be seen as one big job interview, with voters choosing the best possible candidate for the position. By saying so we are not discounting the importance of voting towards a two-party system in our state or country. We are saying that making the choice as a voter based on the candidate’s performance and character would eventually lead to a much healthier two-party system in the government. 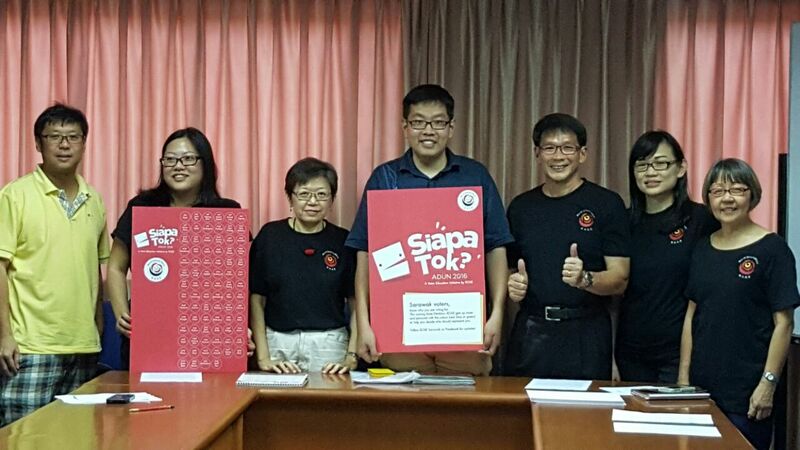 The “Siapa Tok?” project is a positive step forward for the empowerment of voters and increases democratic space via the new media. To this end, Teo strongly urges all Malaysians, particularly key social media influencers, to widely share project “Siapa Tok?” in order to reach Sarawakians throughout the state. In addition to the “Siapa Tok?” initiative, ROSE also runs polling and counting agent (PACA) training for Malaysians interested in getting involved behind the scenes during elections. Properly trained PACAs are an essential component in ensuring free and fair elections as they are equipped to enforce election laws and procedures. All Sarawakians are encouraged to stay tuned for “Siapa Tok?” updates on ROSE’S Facebook page. The announcement by the CM that the government has abolished quit rent on smallholder agricultural land and residential land is welcomed by all Sarawakians, myself included. However, I want to stress that this move of abolishing quit rent does nothing to help the thousands of NCR land owners who are being deprived of their land because of the government’s refusal to recognize the NCR concept of pemakai menoa and pulau galau, both of which have been affirmed by the courts. This is an issue of the fundamental rights of the people to ownership of their land. If the CM really wants to help the people of Sarawak, he should respect the decision of the courts and recognise pemakai menoa and pulau galau as being NCR lands of the people. Those of us with inquiring minds will question the motive for this abolishment, and on the eve of the Sarawak elections. The Chief Minister did not tell us why this decision was taken. If it is to reduce the ever-increasing financial burden borne by the rakyat, the Chief Minister should address his mind to the reasons for the difficulties faced by the rakyat, especially the increased prices of goods and services caused by the imposition of the GST. The Prime Minister was delighted that the GST will net the government RM39 bil in 2016, calling it the saviour of the Malaysian economy. The figures given by the government show that every household will pay around RM5,571.00 extra this year just for GST. This works out to be RM464 per month per household. Working on the figures given by the Chief Minister yesterday, the average quit rent saving for a residential land title holder is RM26.57 while the average quit rent saving for an agricultural land title holder is RM20.83. This RM20+ is a small saving compared to the RM5,571.00 that each household has to fork out to save the nation from the Najib 1MDB nightmare. Meanwhile, the PM refuses to answer the RM2.6bil question and take responsibility for the RM42bil 1MBD financial scandal. And yet, inexplicably, the CM wants this disgraceful man to be the PM forever. Interestingly, on quit rent, the owners of some kampong houses in my area built on untitled NCR lands have been paying quit rent for many years. I urge the government to abolish these as well. Also, to bring more substantial benefit to the people, the CM should move to convert all leasehold residential titles to titles in perpetuity so that the people will have certainty over the security of their land ownership. This would be a more meaningful measure that the people will surely appreciate. It was revealed in Parliament that Sarawak owes Putrajaya RM2.5bil, making us the third highest debtor state. Despite this, the government has opted to forego a portion of one of the normal revenue sources for the state. I hope that this is not a mere political gimmick and that the quit rent will not be reintroduced at a later stage if the BN should still hold the majority of seats after the elections. What hope is there for Malaysia? ANTIDOTE Is it worthwhile to fight for Malaysia? Would you be willing to live and die for an idea, or a principle? Many people would answer no. Few would be willing to die for a nation, or an ideal. Even those who claim they are willing to die for their religion are self-deluded. Their nihilism is, ironically, a form of self-preservation, of trying to survive beyond the grave. Hardly anyone dies for a belief. All too often, we die in spite of our beliefs; simply letting life slip away, day by day, and failing to do much with our ideals. Many friends and I are mourning the recent death of a Sarawakian, See Cho Kee who lived his life for his ideals - decency, conscientiousness, and perseverance. He died of lung disease on March 8, at the age of 76. He was a taxi driver, not a firebrand politician or preacher. But he and his wife looked after a family of four children - three sons and a daughter - with love and care, and raised them to contribute greatly to their society. See was an outstanding Malaysian, humble, kind and gentle. Some of my contemporaries in media and NGO circles have described him as one of the finest men they had ever met. His formal education was truncated when the colonial masters closed his school, Chung Hua Secondary School No 2, claiming communist infiltration. He started his working life printing and delivering newspapers, then worked as a reporter for the Sarawak Vanguard, a local newspaper. This newspaper, too, was shut down by the government for being radical and progressive. He drove a taxi to support his family, a story of self-sacrifice and quiet heroism that is not uncommon among our elderly. One son took after him, becoming an honest and hard-working taxi driver, before starting his own business. His daughter and another son contributed to educating the young (of all ethnic groups) in Chinese vernacular schools, as a teacher and an administrator. Another son, See Chee How, took up land rights law and was elected state assembly representative for Batu Lintang. See Chee How has worked for the rural and urban poor for more than 35 years, first as a human rights campaigner and then as a Native Customary Rights (NCR) lawyer. He survived a Molotov cocktail attack, when he stood up for Iban NCR landowners against palm oil companies and their hired thugs. He nearly drowned when he went on an odyssey to Baram on a fact-finding mission, in support of Penan protesters who had been beaten and gassed by the police and loggers at NCR blockades. He weathered legal threats by Abdul Taib Mahmud, the most powerful man in Sarawak from 1981 to this day. He even endured imprisonment by the Burmese military junta, after he had protested in Rangoon in 1998 against the crackdown on Aung San Suu Kyi’s National League for Democracy. See Cho Kee and his family have all lived their lives in decency and perseverance. They have never given up on the idea of a better society. The current political atmosphere is as toxic as our perennial haze from dying trees. Fear and loathing clog up the air. Any cynic who, as Oscar Wilde described, “knows the price of everything and the value of nothing”, would throw up his or her hands at the state of our Malaysian politics, and give up hope. He or she might retreat into the cynics’ favourite pastime, of surviving; making money, “doing well”, looking after his or her own family, perhaps “migrating”. I would argue, though, that Malaysia is not a basket case, despite the public clowning by ministers and their sycophants. All societies go through their political and economic crises, and the resilient ones grow stronger as a result. Indonesia, for example, lived through the horror of Suharto’s 1965 killings of at least half a million people. Indonesians survived decades of theft and political persecution by Suharto that made Najib Abdul Razak look like Mahatma Gandhi. Yet Indonesia is now far outstripping its neighbours in political, judicial and media reforms. South Korea’s military leaders ran the country like a mafia, and butchered hundreds, perhaps thousands, of university students and workers at Kwangju in 1980. Taiwan suffered under 38 years of martial law, following a Kuomintang massacre of tens of thousands of civilians in 1947. Today, South Korea and Taiwan are flourishing democratic nations, and corrupt strongmen have been humbled in court. Even Burma is moving forward. Can Malaysia do the same? If the many cynical and apathetic commentators in the mainstream media and social media are to be believed, never. But there are people worth fighting for in Malaysia, people like See Cho Kee, Ahmad Sahari and Surik Anak Muntai. Many millions of other, similar decent Malaysian people, of all ethnic groups and religions, go on contributing to our society. We too, have a duty to these fellow Malaysians, rather than to some flimsy concept of patriotism. What hope is there for Malaysia? We are not a failed state, by any measure. We have a duty to be decent, and to persevere. We do not have the privilege of despair. Perhaps a better question is, what hope is there for Malaysians? KERUAH USIT is a human rights activist - ‘anak Sarawak, Bangsa Malaysia’. Press associations in Malaysia have condemned the arrest of two Australian journalists who tried to ask Prime Minister Najib Abdul Razak questions. The Foreign Correspondents Club Malaysia (FCCM) said the premier's security detail could have just blocked the Australian Broadcasting Corporation (ABC) programme ‘Four Corners’ crew Linton Besser and Louie Eroglu, instead of resorting to arrests. "Journalists have no track record of physically harming public officials; in fact, it is usually the other way around. "Yet police are applying 'preventive measures' to reporters, as if they were terrorists," the FCCM said in a statement today. It added that journalists have always cooperated when police needed to question them, negating the need for arrest. It also said that if those in office fear harm to their reputation, they can use civil means such as right of reply or lawsuits. Meanwhile, Gerakan Media Marah (Geramm) said the arrests were an assault on press freedom. "We also believe that the incident could have been avoided if a public official, in this case the prime minister himself, would be more open to being questioned on matters of public importance," Geramm said in a statement yesterday. It noted that since assuming office, Najib has hardly held any press conferences, and those he does hold are usually not open to all media. Besser and Eroglu were detained on Saturday after trying to pose questions to Najib regarding the RM2.6 billion donation scandal. Sarawak police said reporter Besser and camera operator Eroglu had “aggressively” pursued Najib, prompting the arrest. They are investigated under the Penal Code for obstructing a public officer from conducting his duty. ABC has denied allegations that its journalists had acted aggressively. Opposition leaders expect Sarawak elections to be called within the next three months, even if polls could be held on Sept 20, according to the state constitution. PKR and DAP politicians told Malaysiakini today that Sarawak chief minister Adenan Satem would not delay the elections beyond April, as a postponement would not be beneficial to him. “He (Adenan) won’t delay (the April) election because time is working against him,” Sarawak DAP chief Chong Chieng Jen said. DAP election strategist Ong Kian Ming opined that the chief minister will stick to his preferred date. “There will be no change on polling day. Adenan previously announced to dissolve it (the state assembly) in mid-April. Voting day will be at the end of April. “He has a plan (for the state election). Not much changes will be done,” added Serdang MP. Under the Sarawak constitution, the current state assembly’s five-year term ends on June 20, after which it will be automatically dissolved. The state election must be held within 90 days after dissolution, which means that the latest date for polling day is Sept 20. Sarawak PKR chief Baru Bian expects polling day will be held in April, as indicated by Adenan, unless federal steps in. “I don’t think the poll will be delayed. Unless Najib gave instructions to have simultaneous federal election, why should there be a delay of the state election? “Who knows, BN may no longer be governing federal in three months’ time,” said the Ba’Kelalan assemblyperson. Baru said Prime Minister Najib Abdul Razak may call for snap general election, should the anti-Najib forces gather enough number to push over a vote of no confidence in parliament to oust him. However, that scenario - in Baru’s opinion - is unlikely to happen and his prediction is that the latest poll date will be in early May. 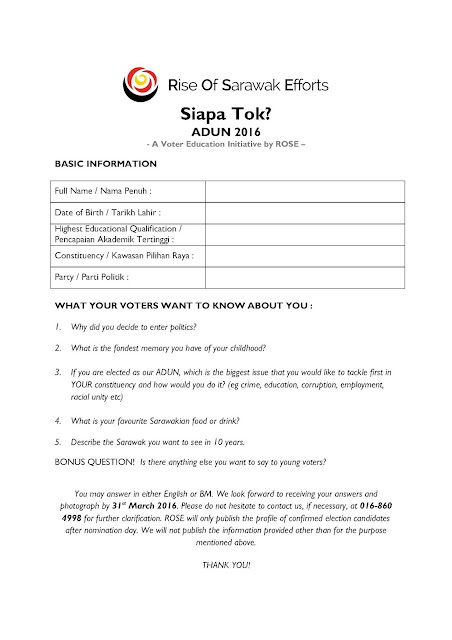 In January, Adenan had suggested to the Elections Commission (EC) that the nomination date be set on April 18, and polling day on April 30, which means it will be a 12-day campaign period. EC, however, has yet to announce the date. While debate on the newly-formed Save Malaysia coalition, led by former prime minister Dr Mahathir Mohamad, has been raging Peninsular-side, these politicians are unsure of its impact on the state. Ong said the coalition is on people’s radar, but it needs more time to create ripples in the hornbill state. “Mahathir does not command a strong influence (in Sarawak). But the coalition has attracted the interest of (local voters). They are watching the development,” Ong, who is the Serdang MP, added. He said the only way it can create shockwaves in the state’s political arena is if the Malay-Melanau community and others get on board the coalition. “But the coalition was formed in a short period. If we want to see the impact on Sarawak, we may have to wait till the next general elections. The people are adopting a wait and see for now,” Ong cautioned. Voters’ interest in the coalition may influence the state poll, said Ong, who is the Kota Sentosa assemblyperson. Baru, however, is banking on the Mahathir-fronted rebellion to unsettle the leaders and supporters of PBB, Sarawak BN’s key partner. “Some BN-PBB people may get confused. We need more time to promote (Save Malaysia coalition). “It’s clear that Mahathir, who was once the prime minister and Umno president, is now opposing Umno. That kind of scenario surely would have some impact (on Sarawak polls),” said Baru. After quitting from Umno in late February, Mahathir had proposed forming an anti-Najib group. Last Friday, at a press conference, Mahathir, together with opposition and civil society, launched the Save Malaysia coalition, vowing to force Najib to resign and institute reforms. BARU BIAN: CM CLUELESS ABOUT 1MDB SCANDAL?